Over the past 100 years, Robblee's has worked with residents of Tacoma and Pierce County to provide high quality products and professional locksmithing and installation of your residential locks. Visit our showroom to see a sample and speak to one of our experts. For more information on how we can assist you, Call 253-627-5448. 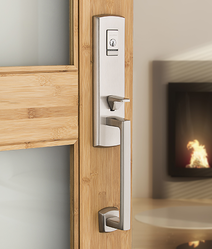 Smart Home locks are now here and available. Control the locking and unlocking of your home door locks from your smart phone. Call Robblee's at 253-627-5448 for more details.